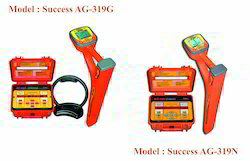 Pioneers in the industry, we offer cable and pipe locator (ag-309), cable and pipe locator (ag-319), cable and pipe locator (ag-438.15n), cable and pipe locator - success ag-511n and water leak detector with cable detection from India. 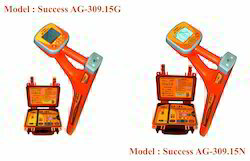 High tech device for detection of cables and any metal pipelines with integrated GPS/GLONASS module. High tech device for detection of cables and any metal pipelines, with direct digital measurement of the current. 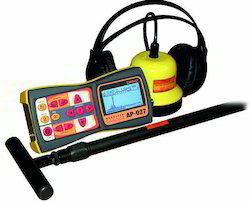 High tech kit with multi-frequency transmitter for buried utilities detection in the difficult conditions. 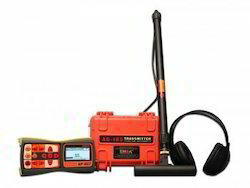 High tech kit with multi-frequency transmitter for buried utilities detection in the difficult conditions with integrated GPS/GLONASS module. Easy-to-use kit for detection of metal pipelines and cables consisting of receiver AP-027, electromagnetic sensor and transmitter. New easy-to-use cable and pipe locator based on AP-014 receiver. Detection of cables and metal pipelines underground up to 6 m depth. Measurement of the depth by passive “electromagnetic” method. Distance of tracing from the place of transmitter connection is up to 3 km. Survey the ground before the ground works (BB mode). Tracing of the buried utility without direct connection to it. Acoustic water leak detector for metal and non-metal underground pipelines combined with extra function: detection of underground energized cable. 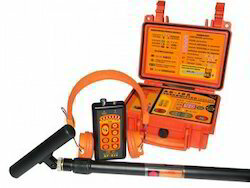 Looking for Cable & Pipe Detector ?